These Plug-in units can be used to monitor Temperature levels, Alerts and Power Outages, sending SMS messages using the GSM network. They are configured using SMS messages and plug into a mains socket. Versions are available for UK and EU. For other mains socket types, please contact us. ThermoTxt - Power Outage Alert, Temperature Alert, plus control connected appliance dependant on temperature. Plug-in Temperature and Power Loss Alert device. 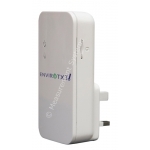 Uses GSM network to send Alarm SMS messages. UK Plug. Plug-in Temperature and Power Loss Alert device. Uses GSM network to send Alarm SMS messages. EU Plug. Plug-in Temperature and Power Loss Alert device. Uses GSM network to send Alarm SMS messages. UK Plug. Can also control Output connector On/off via Temperature Alert. Plug-in Temperature and Power Loss Alert device. Uses GSM network to send Alarm SMS messages. EU Plug. Can also control Output connector On/off via Temperature Alert. Plug-in Power Loss Alert device with ability to switch the connected appliance On/Off Remotely. Uses GSM network to send Alarm SMS messages. UK Plug. Plug-in Power Loss Alert device with ability to switch the connected appliance On/Off Remotely. Uses GSM network to send Alarm SMS messages. EU Plug.